Is There A Worst Kind Of Debt? 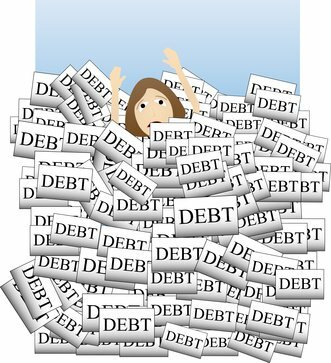 HomeBlog Personal FinanceIs There A Worst Kind Of Debt? If you’re wrestling with debt and it’s already pinned you twice, you may think that all debt is the worst debt. But when you stop to think about it, there are actually five kinds of major debts. So which of these do you think is the worst? Is student loan debt the worst? These loans are most often given to people who are young and have no experience with credit and no clue as to how they will pay them back. Balances can be as high as $30,000 or even more and the people borrowing this money may not be able to find a job to make their payments. And unlike other types of consumer debt, it is almost impossible to discharge student loan debts through a chapter 7 bankruptcy. Student loan debt may not be the worst type of debt because college graduates almost always earn significantly more money over their lifetimes than those who do not have a college degree. This means that student loan debt can actually be considered as an investment that will pay off in the future in earning power. Plus, it’s possible for students to defer payments on their loans during times of economic hardship. This makes them a bit more flexible than other types of loans. Is credit card debt the worst? The problem with credit card debt is that with interest rates averaging around 15% or even more than 20% in some cases, it’s just about the most expensive type of debt that you could carry. In addition, if you continue to make just the minimum payments every month, you could remain in debt for decades. In fact, we recently saw one example where if the person owed $10,000 and continued to make only the minimum monthly payments, it would take her nearly 28 years to get out of debt. As noted above, continually making just the minimum payments on a credit card debt is not a great idea over the long run. However if you get in a financial pinch, this can be a handy option to help you get back on your feet and without hurting your credit. Plus, if you can’t pay back a credit card debt you don’t have that much to lose. It’s unsecured debt, which means it’s not as bad as getting behind on a home or auto loan, which are secured debts. Your credit card company could decide to sue you to collect on your debt but that usually occurs only after months or even years after you quit paying on it. Is mortgage debt the worst? If you don’t understand how bad mortgage debt can be, just ask the owners of around 8.8 million homes that have negative or near-negative equity. This means these homeowners are underwater or at or close to owing more than their homes are worth. What this translates into is that they can’t sell those houses without having to use cash to pay off their mortgages or doing short sales that would damage their credit scores. Also, since it typically takes 30 years to pay off a mortgage, this could end up making one’s home feel more like a financial prison than a castle. On a brighter note, you might be able to qualify for mortgage debt forgiveness as explained in this video. Owning a home remains one of the best ways for Americans to build wealth. Assuming you can keep up with your mortgage payments, you will eventually pay off your house and will then have inexpensive housing or you could turn it into rental income. When you build up equity through paying on your mortgage you can access it via a reverse mortgage or by selling the house – or you could pass it along to your heirs and maybe tax-free. Is tax debt the worst? There can be a number of painful consequences if you owe the IRS or your state taxing authority. For example, you may have a tax lien filed on your house and your credit score would plummet. Government agencies have strong collection powers up to and including the ability to seize money in your bank accounts or other property or to intercept tax refunds you would qualify for in the future. The Internal Revenue Service has repayment options giving you the ability to pay off your tax debt over time and at a fairly low interest rate. And you don’t have to have good credit to get approved for an installment agreement as you would if you were applying for a loan. While a tax lien will show up on your credit reports you should be able to get it removed by entering into an installment agreement. Is auto loan debt the worst? Today’s auto loan now averages about 5 1/2 years and some for as long as six or seven years. What this translates into is that you will be making payments long after that new car smell has worn off and well into the time when your repair costs and maintenance costs start getting high. Even worse, you could be stuck if you need to sell that automobile because you might be upside down – or owing more on the loan then you would be able to get for that car or truck. You probably budget for your car payment and as long as you don’t run into unexpected problems. Plus, you might be able to refinance your auto loan and lower your monthly payments if necessary. If you pay off an auto loan on time this can help your credit score Auto loans rarely represent a problem unless you have several car loans that are outstanding all at once or if you miss some of your payments. If none of these are the worst kind of debt, what is? It’s debt you can’t pay back on time. In the event this occurs, your credit scores can plunge, your balances might grow larger because of interest and fees, and you could find yourself borrowing even more money to try to keep up with your payments.